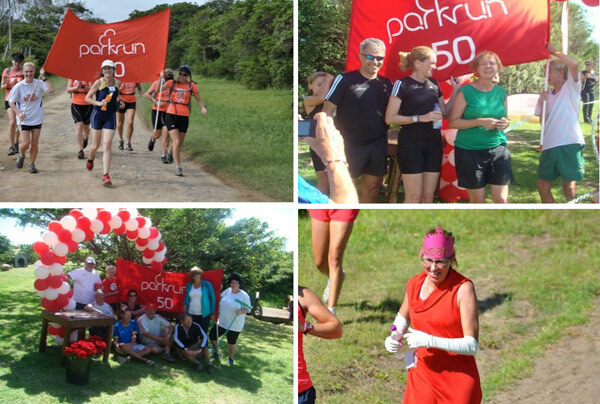 In this first edition of the 2014 SA parkrun newsletter, we hear about the parkruns that recently launched around the country, topping the 50 000 registration mark. Modern Athlete magazine features two SA parkrun events every month. 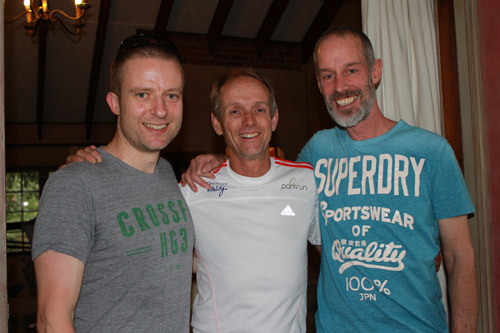 Founder of parkrun, Paul Sinton-Hewitt and UK parkrun manager, Tom Williams, visit South Africa to enjoy the Delta parkrun experience. This summer has been a very exciting time for parkrun South Africa starting with the December launch of our newest parkrun in Fish Hoek. Event director Richard Healy has devised a lovely run through Cape fynbos and around the fields of the Fish Hoek sports club. An enthusiastic crowd of locals and welcome visitors from other South African parkruns were there to christen the inaugural run. 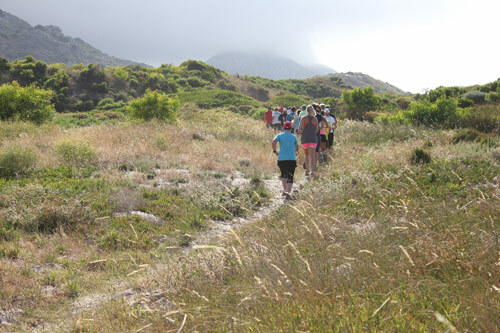 We have no doubt that Fish Hoek parkrun will prove very popular with locals and visitors alike. On that note, it was very gratifying to see our coastal parkruns welcoming many up-country and foreign parkrunners. Our parkrunners have learnt that their barcode gives them access to lots of fun at other parkruns. 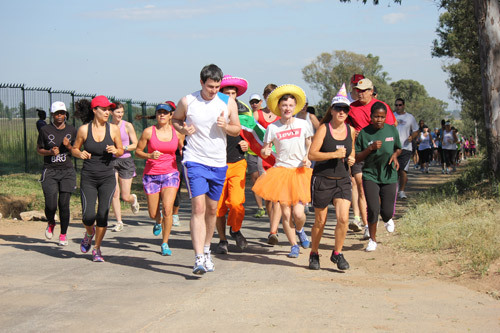 This month parkrunners celebrated the first birthdays of Sunrise-on-Sea and Modderfontein Reserve. Both events produced record fields for their parties. This last week we welcomed two special parkrun guests to Johannesburg; Tom Williams (country manager for parkrun U.K.) and Paul Sinton-Hewitt parkrun founder. Tom and Paul ran Delta Park parkrun and despite the heat, hills and altitude they acquitted themselves really well (check the Delta results 18th January!) At a fun drinks party at our house Paul and Tom were able to meet our various regional directors and some of our Gauteng event directors. While the occasion was informal it was invaluable for exchanging ideas and looking ahead to an exciting future. Their visit was an auspicious one because on the same weekend there were record fields at 13 of our parkruns. At the same time we reached the astonishing milestone of 50000 registered parkrunners!! As one of our proud parkrunners stated, “parkrun South Africa has come of age”. This Saturday sees the launch of our Bryanston parkrun. 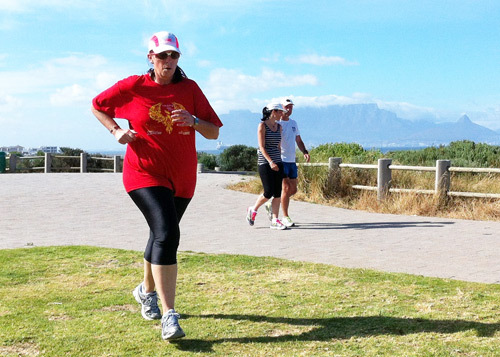 On the 7th February our fourth Cape Town parkrun will launch at Rondebosch Common. There are several more exciting parkrun launches in the pipeline but that’s a subject for a future newsletter. The wrong type of running shoe can result in pain or even injuries. It’s worth the effort, and the expense, to choose the best possible shoe to meet your needs. The Vitality HealthyGear benefit gives you up to 25% cash back on adidas gear at adidas and Totalsports stores. Warming up, cooling down, and stretching when exercising, are very important. When you’re finished with your run, remember to do some static stretching so that you reduce muscle soreness and stiffness. The January edition of our Media Partner, Modern Athlete Magazine is now out. In it you can read about the Dusi parkrun in Pietermaritzburg and the Ebotse parkrun in Benoni. To read the Digi-Mag, simply click here or, subscribe to receive it to your inbox on a monthly basis. My family and I made plans to visit Miami Florida during December 2013. When our plans were finalized and tickets were issued, I told my hubby that we need to make time for a parkrun in Orlando. Imagine the look on his face. His response was “Seriously Rhoda, can’t you go without parkrun for one Saturday?” I said “no”, wherever I find myself I will seek out the nearest parkrun venue. On 28 December 2013 I was fortunate enough to participate in a parkrun in Orlando which is situated in Claremont at a Historical Village. Claremont is 45 minutes’ drive from the Holiday Inn where we were staying in Lake Buena Vista Florida. There are currently 3 parkruns around the United States. They are situated in the following states, Orlando Florida, Livonia Michigan and Durham NC. It is currently Florida’s winter season and the degrees vary from 26 to 28 degree. This is practically South Africa’s summer temperature and it was a breeze doing the route. The course is flat and very easy as it is run on asphalt paths. If you get tired, you can just enjoy the magnificent view on the lake as this is takes place on the water-front from start to finish. Since speaking to Karen, the event director, they are still in the process of getting sponsors on board. Their numbers per parkrun varies between 60 – 90 parkrunners. That’s no surprise, the view is very relaxing and the water is sparkling on sunny days. Karen and her team are an amazing group of people. They truly are great ambassadors of parkrun. After the event we all had breakfast at Cheeser’s Palace Café where we exchanged pleasantries about parkrun and international visitors. Thank you Karen for hosting us. Let us know when you will be visiting our beautiful country. 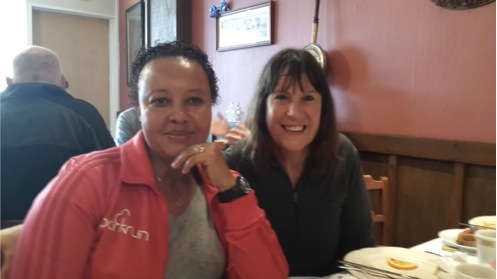 parkrun is creating many stories around the world and one story that touches my heart most weeks, is seeing Rene Bosman from Big Bay running towards the finish line with such determination in her eyes. Rene started with us from the very beginning as a volunteer but deep down in her heart she had a desire to get fit and start running. After many Saturdays of scanning and marshalling, we encouraged her to take a break and walk a parkrun. The bug bit and she is now not only walking but running and aiming for her first race in the next few months. Keep inspiring us Rene! WOW!!! 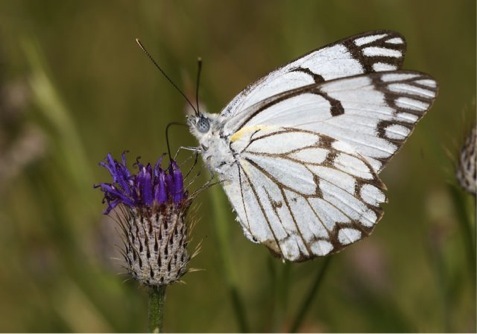 Aside from witnessing the annual migration of the Belenois Aurota, commonly known as the brown-veined white butterfly (pictured below) The Ebotse faithfulls plus 91 first timers, turned out en masse, to bring our total finishers up to 345 - almost equal to all those butterflies! The New Year’s resolutions really kicked into gear and it was fantastic to see so many new faces. The statistics that parkrun produce each week always make interesting reading; for example, at Ebotse - 1760 runners from 58 different clubs have achieved 2111 PB (personal bests). But the ‘unattached’ runners and walkers that are making the effort to get fit, bringing families out to enjoy fresh air and nature, each week - challenging themselves to improve their time, make parkrun the success it is. This week an ‘unknown’ runner took first place honours from Ian Brown who has taken 1st at Ebotse on 6 previous occasions. We welcomed Jeni Leece our 3rd walker into the 50 Club. By mid-year we hope to award our first 100-Club T-shirt to our race director Gary Jackson, closely followed by Darryl Goosen without whom no one would get their results, and Martin Cordier, who has got his whole family on board for weekly parkruns. Do yourselves a favour go to the parkrun website and check the statistics for yourself - visit as many parkrun venues as you can – it really is a fun thing to do on any Saturday. Here we are one year later and still going strong. We celebrated our first birthday on Saturday, 4 January 2014 with a record field of 145. Our event was also graced by two 100 club members Dave Venter and Ingrid Wagner with 174 and 175 runs respectively. Great day it was indeed thanks to the girls we had two cakes and a beautiful finish arch with red and white balloons. This befitted the theme “Royal” as were the few kings and queens present. It was indeed a year full of milestones, including the first 50-Club member in SA to do 50 consecutive runs at the same parkrun event - good one Tia Marie. She is now going for 100 I am told. On our birthday Roseanne Swart also joined the 50-Club. There are 7 Volunteers who have worked at Sunrise-on-Sea parkrun 50 times in one year - these are non-runners from our community. We have encouraged them to don running kit, without any success. parkrun has changed a lot of lives in our community and hopefully it will continue doing so in 2014. Thanks to the parkrun team and community for making our first year special. Here we go… bring on year two. The 21st of December saw a lot of generous parkrunners from North Beach enjoying a HOT run after leaving donations of toys under the local Christmas Tree. The prezzies were donated to the incredibly happy and grateful team at St Thomas Home. Santa Clause came to parkrun town and handed out sweets to all the kiddies, even enjoying photo opportunities with our young-at-heart adults. Over 350 people came out to enjoy their pre-Christmas run in the Durban humidity, with many visitors from Delta and Nahoon (who were “used to breathing their air, not drinking it”). All of our runners enjoyed their refreshing Fruttare after their run and went home happy and ready for a festive week ahead. The North Beach parkrun team wishes you all an amazing and successful 2014, and hope to see you all 52 times this year for a 5k.